Artists have the same concerns as the rest of us; they have a unique medium, with visual and visceral expressions. Each carries messages. This page was inaugurated with Vivienne Stein. 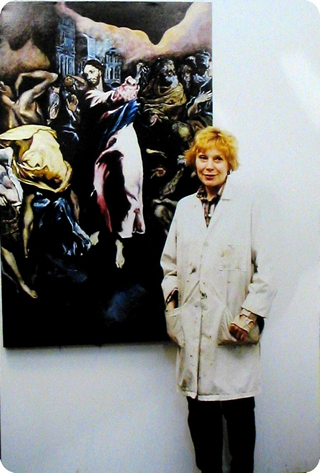 A similar take is presented in Realm of Silence by Elvire Coriat de Baere. "In my point of view, the crucial first step in better thinking is to see things without limiting our vision. "As humans we are feeling creatures. Before we even start thinking, we are feeling. Feelings are the world we live in. "A belief system is layered onto those feelings, when we are tiny children, by the culture in which we are born. We live and die for these belief systems. Most belief systems speak to respect and love of one another. Yet that message is lost. Why? "Death gives me a sense of urgency. In 1980 death took my beloved friend, husband, and soul mate, setting me on a path to do this art project. Plunging into an obsession of work, I searched for more skills and knowledge, traveling worldwide in my quest for answers to the many questions that kept coming up. I researched many different cultures, especially their art. How and what people think and how they get their belief systems: India; Hinduism, China, Taoism, Confucianism: Nepal, Japan, Buddhism, Egypt and the Middle Eastern countries, Islam, England, Europe, Canada, New Zealand, Australia, Mexico, Home, in the US, our Judeo-Christian belief system. "More friends die of AIDS. Horror stories of young people dying with AIDS alone without loved ones or friends. Then it hit me. How could this be? Today, if Christ were alive today, with all Love, Compassion, and Power, [he] would be helping and giving to our sick and dying, as he would his Apostles. Have we lost the message, "love thy neighbor as thyself?" 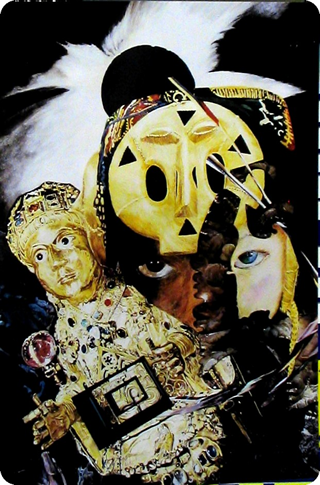 "My art project is a series of 16 paintings [We reproduce four of them here] in which I use images from our world and iconographic symbols from the heart of Judeo-Christian teachings. In my painting, "The Morpheus of consciousness" or "We sleep and Our World Dies" my point of view is that we are all connected with fellow human beings and our planet. 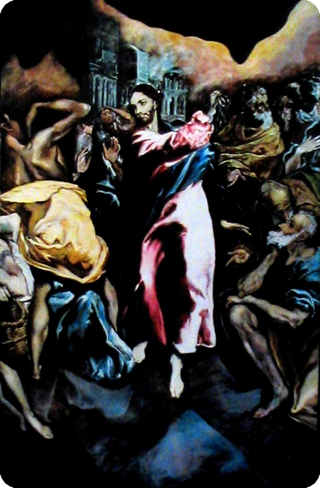 In Homage to El Greco's "Christ Cleansing the Temple," I restate the fact that we have lost the message of love for one another. 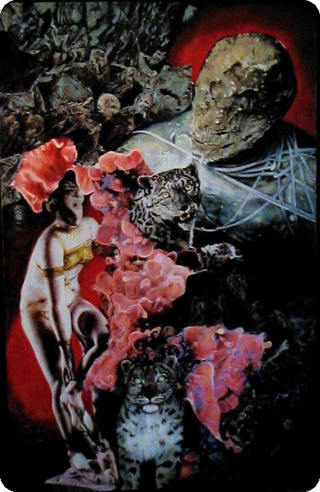 In "There is Always Another Tiger," I show the AIDS virus coming between male and female with death all around in the painting. I asked my late husband, a Professor of medicine, "Why do we have diseases like the Black Plague, Polio, STDs, syphilis and now Aids?" He said, "Vivienne, there is always another tiger." Protection of self and one another is key to survival. No more, no less, AIDS kills -- we need to pay attention. If we do not modify our behavior and thinking we are doomed, as I show in "Apocalypse Now," destruction need not be. We need to heal our planet as well as our whole human family to the bonds of love, respect, peace, and charity. "My back-up team are the twelve Apostles. I changed the posture of El Greco's Apostles from one of angelic repose to expressions of anger. It's time to get back on track; to love and respect one another. From the behavioral psychiatrists, Dr. David Viscott, Dr John Bradshaw, and others, I have learned that we need to address the incorrect behavior / thinking of a person, to allow the spiritual God Force to resurface. That force, is key to interaction between people, it seems to me, is the right way to love and respect another human being's spirit and space. While the Apostles are angry with us and wish to return to loving one another, they still love us. "In my Mirrors of History and the 12 Angry Apostles, I challenge the viewer to pay attention to what has been lost from belief systems. With the extraordinary character of the times in which we live, our attention should unremittingly [be] fixed on the safety of our young world-wide. "Bridges are built of bonds of respect, love, common wants, and common needs, with a spiritual awareness for our family, the whole human race, and our earth our home. my paintings of history call to us all to CARE. ... "
"Painting shows the AIDS virus between man and woman." "I asked my late husband, a professor of medicine, "Why do we have diseases like the Black Plague, Syphilis, Polio, STDs and now AIDS?" He said, "Vivienne, there is always another tiger." "If we do not change or modify our behavior we are doomed." "We Sleep and our World Dies." "We can emulate Christ cleansing the temple to bring home the point. hatred for differences, and greed from our lives." "Painting is not exclusively visual; it is an act of the soul. It is the means by which I express my passion, my emotions and sensitivity for the subject I portray. "My love for painting has been lifelong, first in its observation and study, then in my own expression, which celebrates the magical beauty of nature, its power and serenity. My art depicts mostly landscapes, seascapes, still life, flowers, and children. "I have benefited from academic training in French modern art. My work shows the influence of the Old Masters and French Impressionism. 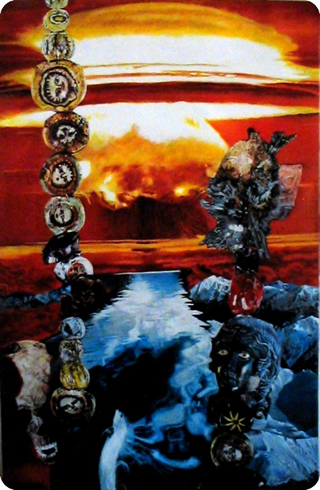 "The nine-Painting series "Realm of Silence" is a response to my thoughts on some of the most powerful images of the twentieth century. I have excluded color to evoke a sense of loss and despair. "In reading and reflecting on World War II, images of human atrocities filled my soul, mind and heart with an undeniable pain. Nowhere in the history of mankind has such dehumanization happened. Through my paintings and Poetry, I feel an urgency to hold sacred and perpetuate the memory of those who perished. " Posted by RoadToPeace on Wednesday, August 31, 2005.